P3D v4.4 coming for the 11/28th ! Well time for the last update ! I'm surprised Ivana didn't get this one ! Updated rendering engine to support Physically Based Rendering (PBR) content. Photoreal textures can now be rendered at 512×512 and 1024×1024 resolution. Scenery draw distance, including airports, can now be configured. Enhanced night lighting based on moon phases. Most add-ons can now be activated and deactivated at runtime without requiring a restart. Multiplayer hosts can now change the time and weather during a session. Added visual notifications when chat messages are received in multiplayer. Added scroll wheel zoom control to map screens. Emitters can now emit particles underwater. Added support for placing panel windows in 3D space. Added Augmented Reality (AR) support using pass-through cameras on standard Vive headsets. Added menu bar and context menu support when using Virtual Reality (VR). Added gaze selection control mappings and mouse dragging functionality to VR. Now you can use head movements to control the mouse and select buttons in Virtual Cockpits. Cockpit tooltips are now available in VR. Added voice control debugging to show phrase detection in real time. Added debug label drawing for Distributed Interactive Simulation (DIS) and High-Level Architecture (HLA) interfaces. Currently shows various parameters including name, entity ids, and IP address. DIS can now be configured while in SimOperator. Added the ability to enable, disable, and modify DIS dead reckoning in real time. Added Common Image Generator Interface (CIGI) 2.0 and 2.1 support. Added CIGI packet interception interface. Added generic directed energy (laser) weapon support. Added generic torpedo weapon support. Submersible SimObjects now support weapons. Made optimizations to water rendering by removing unneeded emissive samples on water-only tiles. Fixed flight planner issues including waypoints being cleared and various problems with third-party created flight plans. Added additional checks preventing black dynamic lights from being processed. Fixed inconsistent specular and emissive values between land, water, and land+water shader variations. Added distance-based texture requests for vehicle and library objects. Fixed issue where terrain texture tiles could be incorrect for one or two frames at night. Fixed issue where some terrain tiles were missing on max settings in some parts of the world. Fixed several scenery library sorting issues. Fixed issue where flight planner waypoints would not load correctly from a scenario causing ATC errors due to a failed departure airport look up. Fixed issue that prevented some bridge segments from drawing. Fixed issues with dynamic reflections distorting when zooming camera. Fixed issue preventing global custom cameras from saving and loading correctly. Fixed issue that could sometimes cause missing autogen at scenario start. Vehicle/avatar changes can now be done in a multiplayer session depending on host settings. Fixed issue causing transparent objects in virtual cockpits to draw incorrectly in some cases. Fixed issue that could cause minor visual artifacts in some aircraft models. Fixed 2D panel transparency when using multiple render-to-texture views. Fixed issues with certain taxiway and apron path intersections preventing beziers from drawing and layering correctly. Fixed several multiplayer chat bugs that prevented players from communicating using the chat window and voice communication. Fixed sound distortion issues at high framerates. Fixed panel texture elements not rendering below other elements when window was undocked. Fixed issue with attachments preventing simulation logic from disabling for SimpleSimObjects. SimObjects can now use mobile scenery models by mapping the appropriate visual model GUID. Fixed issue that could cause the Window Definition menu item to be disabled. Fixed issue where VC texture’s alpha was not respected in Scaleform-based VC panels. Prevented redundant control settings saves. Added errors reporting if controls settings fail to load. Fixed sizing issue with instrument panels when loading a scenario with an active view group. Increased max frame rate limit from 60 to 120. Added additional clarification to license activation errors. Added finer resolution to Helicopter autopilot altitude hold. Ambient wind is now factored into hover logic for helicopter AI. Fixed case where extreme collective movement could occur in altitude controller for helicopter autopilot. Changed the default HDR Brightness, Bloom, and Saturation levels back to 1.0. Sim rate overrides can now be configured for AI vehicles. Updated beacon lights to use dynamic lighting and removed cone geometry. Fixed an issue where detached avatar control mappings were not loading correctly when switching between avatar objects. Fixed 3D panel aspect ratio bug that could occur when exiting VR. Increased default camera LateralMoveRate, LongitudinalMoveRate, and VerticalMoveRate which slightly increases cinematographer camera movement. The Panel Manager window is now available on all vehicles. Moved video capture location to the My Videos directory. Fixed issue where Scaleform overlays would not be captured in video recordings. Fixed issues with the piston engine damage timer. Fixed issue that could cause large onscreen text blocks to have missing characters in some cases. Fixed PDK shutdown error when a C-130 variant was the user vehicle. Fixed issue that prevented mouse up events from being properly handled on virtual cockpit elements if the mouse was no longer over the object. Fixed crash in map system that could occur when making changes to the scenery library. Fixed crash that could occur during startup if error conditions were present. Fixed crash that could occur when changing DPI settings without logging off. Fixed crash that could occur when using controllable cameras. Fixed crash that could occur in multiplayer under certain connection conditions. Fixed potential crash with Scaleform Panels in VR. Pausing will now also pause the timer for message windows. RTT views will no longer show in the Manage Cameras user interface (UI) screen. Various improvements to the Manage Cameras screen including closing the window with the escape key and correctly focusing the window when opened. Various improvements to the Add-ons UI screen. Added button to Manage Camera screen to pull in data from the active view’s camera. The Vehicle Preview window now preserves the zoom level when switching vehicles. Adjusted width of the End Scenario screen. Fixed bug with pause state not loading from fxml files correctly when loading from the startup screen. Added map and vehicle preview windows to the multiplayer host and mini-chooser UI screens. Fixed issue with Show On Startup setting not saving correctly for the Scenario Startup screen. Focal points and on-screen text have improved support for multi-line text. Removed the Restore Time On Move checkbox from the startup screen. Updated the Observer Management UI. Updated Time of Day and Weather UI images with higher resolution versions. Moved multiplayer realism and change location settings in multiplayer UI. Updated render mode for UI windows to be hardware accelerated. Added voice controls for VR gaze clicks. Updated soft particles and decals to support single pass VR depth reconstruction. Fixed issue preventing the ATC window from showing up in VR. Fixed issue with Scaleform panel background being black in VR. Added key command for toggling the VR Menu bar and context menu. Windows placed in 3D space now persist their locations when entering and exiting VR. Made minor adjustments to VR window controls. Added more precise VR error reporting when using Oculus headsets. VR cursor is now scaled to remain the same size on screen regardless of where hit was detected. Added max distance configuration for VR mouse picks. Added voice controls to change views and view categories. Added global certainty override to VoiceControl configuration. Updated framework to .NET 4.7.2. Added CIGI link to Network Overview documentation. Update Learning Center table of contents (TOC) titles. Fixed flight planner documentation to correctly refer to the updated flight planner UI layout. Added quick reference guide to default voice control phrases. Added documentation covering AR, portals, and gaze mouse control. Created VR documentation section in the Learning Center. Made several CIGI weather control fixes. Post process lists for sensors now supported within CIGI. Fixed CIGI issue that caused polarity effects to remain on screen even after sensor was turned off. Fire control system now sends updates in multiplayer keeping the current target in sync. Added DIS enumeration for Torpedo (Mk 48). Added laser fire and detonation DIS PDUs. Fixed DIS tail number fallback logic. Fixing an oversight in DIS with a dead reckoning value of 0. Added new DIS enumerations to various objects. Added the ability to choose between World or Body space for dead reckoning in the DIS options menu. Prevented invisible objects from broadcasting across DIS when first being created. Weapon cameras will now be the nose view of the weapon by default. DIS UI window is now modeless. Fixed crash that could occur on a CIGI IG when closing a docked view. Fixed cases where HLA entities were not being created. Fixed CIGI issue causing IG Short Art Part packet contents to be overwritten in some cases. Added white list capability allowing scenario creators to limit the amount of available objects in SimDirector. Added CreateCamera option to entities allowing AI objects to automatically create a tracking camera attached to these objects. Added Simulate bool to entity objects allowing objects to stop simulating but still render. Added EntitySimulationAction to change the simulation state of entities dynamically in scenarios. Fixed issues with bounding box placements and sizes on some objects. FailureAction now updated to match failures available with currently referenced vehicle. Virtual and Flight Instructor modes now show all scenario objects. Fixed crash when selecting objects while the Attachments window was open. Fixed several focal point drawing issues. Focal points no longer draw icons in Sim Editor mode. The MDLGuid property now displays the model’s GUID in addition to the model combobox. Fixed minor validation issue with ViewChangeActions. OneShotSoundAction now plays correctly if called after a 0 second timer at the beginning of a scenario. Added SpeedKnots property to ownship entity options. Entities and MobileScenery will now default IsOnGround to true when first placed preventing them from being displayed underground. Added tooltip explaining why sound recording is disabled based on Sound Type for SimDirector sound actions. OneShotSoundActions now save elapsed time and resume properly if scenario is saved during playback. Fixed file read errors when booting directly into SimDirector via command line. PanelWindow object now works with mission and UI panels. Moved the Snap to ground button to the Edit tab. Altitude and PBH changes now remove IsOnGround flag for AI, UserOwnship, and UserAvatar. Fixed issue with AGL not adjusting for ground elevation with vehicles. Moving objects now preserves IsAGL altitude rather than recalculating altitude based on elevation. Gizmo state is preserved when deselecting and reselecting objects. Increased translation gizmo mouse hit area to match rotation and scale gizmos. Fixed issues with audio recording within SimDirector. Center on object now positions camera directly over the object. Mouse icon now changes when hovering over object icons to indicate they can be moved. Fixed crash that could occur when trying to browse for a OneShotSound. ViewChangeActions are now disabled on the main window when in SimOperator. Fixed issue that caused VI sessions to not play back mouse events correctly. Fixed issue with AI recording playback not starting if an ownship recording is playing. OneShotSoundRecordings and FlightInstructor recordings are now moved when saving from the P3D default directory. This will move relative files from %APPLOCAL% to the new scenario location. Fixed issue that could prevent camera views created in SimDirector from playing sound. Added AGL toggle to ownship object. Removed PointOfInterestActivationAction and merged it with ObjectActivationAction. Animal SimObjects can now follow waypoints. MobileSceneryObjectController is now defaulted to a non-zero value. Fixed issue with SimDirector catalog view being cut off at certain resolutions. Fixed case where setting IsGlobal to true would prevent actions from firing in single player scenarios. Fixed stack overflow that could occur in certain scenario configurations. Fixed issue preventing OnCompleteActions from firing on PlayFlightRecordingActions in some cases. Fixed issue where OnCompleteActions would fire when a PlayFlightRecordingActions was executed instead of when playback was finished. Fixed various visual issues seen when opening SimDirector. Fixed collision triggers not firing in Preview Mode. Standardized Focal Points to always be activated when created. Fixed issue where crash detection would be permanently disabled after entering preview mode. Removed new line which caused extra space in property grid description for TargetPlayer objects. Added additional clarity to MobileSceneryObject behavior in documentation. Indago UAS is now a user-selectable custom vehicle with auto-land capabilities, tracking camera, and custom UAV control scheme. Several large explosion effects added. Reintroduction of VEH_air_firetruck that was removed in a previous release. Generic 60ft Pusher Drone AI object with PBR textures. Drone 3 AI object with PBR textures. MHTK Launcher box AI object with PBR textures. 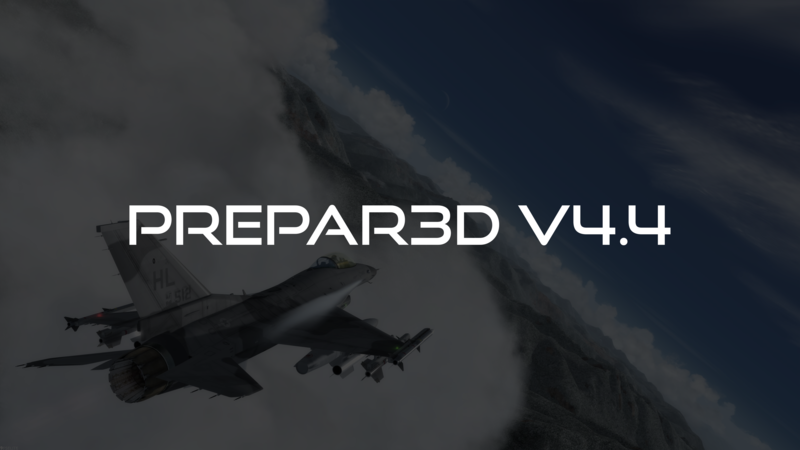 F-16 aircraft fully updated to PBR for both the interior and exterior models. Added example targeting pod to F-16 cockpits with controllable camera, IR sensor modes, zoom control, ground and entity targeting, and weapon target syncing. Tail numbers can now be modified on F-16s, C-130s, MH-60s, UH-60s, and CH-53s. Added laser weapons as an example to LCS variants. Added friendly names to F-16 controls. Added the new torpedo weapon to the Ohio Class Submarine AI object. Fixed texture errors on C-130 fuel tanks. Fixed flag textures on C-130s. Added RecordAndPlayback.xml file and necessary set/get functions for Driver ISimObjects. Updated/removed unused control mappings. Fixed ghosting tail number for 3 different F-16C variants. Added dynamic lighting to several explosions and firework effects. Slightly repositioned eyepoint in C-130. Updated MH-60s and UH-60s with animated Turn and Slip ball indicators. Updated the AC-130H gun effect so that it no longer lags behind the aircraft. Updated AC-130H gun effects and moved attach points. Corrected several Desert Hawk 3 animations and materials. Additional tuning and stability updates for Desert Hawk 3 including improved waypoint following. Added pilot camera to Desert Hawk 3. Removed ground bump from Orion and SLS. Fixed typo in C-130 payload. Updated S-97 AI object animations and tuned contact points, lights, weapons, and various other properties. Added missing DesignSpecs section to various animals. Fixed crash seen by some users when opening the ACM panel in the P-38. Updated mouse pad textures in control towers. Removed all Beechcraft (Textron) related aircraft and scenarios. Fixed trench running through large areas in Iran. Added several representative military jets to AI traffic. These require military cargo/combat parking spaces to appear. Fix for specular value of bare desert that caused background globe to be brighter than generated textures. Golf courses can be layered on top of airport backgrounds. Added several new scenery objects including warehouses, wooden pallets, wooden shipping crates, and military tents. Updated modeling tools to support creating Physically Based Rendering (PBR) content. Added material scripting support to PBR materials. Added PBR support to autogen tools utilizing Materials.xml/spb. Engine supports mixed materials enabling content to have PBR and non-PBR materials on the same object. PBR materials can be previewed in real time within 3DS Max. Model version will automatically update if PBR is used to prevent models from loading in previous versions. Added support for multiple autogen description files. Files can now also override subsets of autogen content. Native SimObjects can now register custom properties and events. Added panel.cfg entries for 3D placement of panels in Virtual Reality. Scenario panels can be added to application menu. Updated SDK samples to Visual Studio 2017. Real-time subsystems can now be attached and configured to any SimObject. Added SLI and texture format options to Rendering System in PDK. Update image tool to have RGB per channel viewing. Added IMultichannelService to the PDK. Added custom DIS PDU support to the PDK (Pro Plus only). Add an EVENTTYPE_NOT_MAPPABLE for ISimObject events that should not appear in the Controls Assignment UI. Consolidated all PDK code samples into a single SDK Samples solution. Added accessors and mutators for the world space offset, size, and camera reference in the Window PDK. Exposed Fuelflow -> N1 controller table in .air file allowing more control over the FF-N1 relationship. Added stop sound function to PDK. Can stop one shot and looping sounds. Added PDK call to get tooltip text for windows. Added 2D and 3D text drawing to the PDK. Added send/receive callback functionality through the PDK for intercepting DIS packets. Tail number colors can now be configured. Added ability for add-ons to override native key events. Added eyepoint (lat, lon, and alt) SimVars. Added SimProp and Configuration services to SDK. Added fallback script directories for SimObjects (similar to how texture directories are handled). Material scripts for placed BGL scenery objects now have access to adjacent texture directories when loaded. Corrected several internal QueryInterface and QueryService calls preventing ISimObjects to correctly respond to service requests. Fixed issue with model exporter producing invalid values with certain models leading to minor visual artifacts. Fixed issue preventing elements from previewing correctly in the Ace tool. Changed name of external forces to explosion forces for clarity. Fixed externally registered Force/Moment management for SimObjects. Added check to prevent registering duplicate services through the PDK. Titles can now be modified for sim configuration UI windows. Fixed QueryInterface issue with IRenderData in the PDK. Added ISimObject RegisterSimulation overload that takes in a min/max simulation rate parameter. Simulation rate for objects can be modified using the PDK. Updated the SetData SimConnect sample to show how to use structs with different data type members. Fixed PDK sample art scripts. Fixed incorrect return values with create and remove texture PDK calls. Removed invalid SDK sample code build configurations and standardized output directories. Moved ISimObject samples to PDK ISimObject sample directory. Fixed an issue where PDK mouse rectangle ID’s would not persist between loads. Added non-version specific queries for ISimObjectManager queries for user, avatar, and other IBaseObjects. Fixed SDK Scaleform Autopilot sample to support Units of Measure = Metric. This applies to Altitude Hold and VS Hold. Added Managed Voice Control sample back to SDK Samples.sln. Simplified the Camera PDK sample. Renamed car ISimObject sample to SimpleCar for consistency. Added basic waypoint following to SimpleCar sample. Fixed crash in targeting pod sample if vehicle did not have a FireControlSystem. Refactored HMD sample to use new 3D panel functionality. Converted radar panel callback to use an add-on.xml for installation. Added fix for the Show Location marker not appearing correctly in the FX Tool. Fixed crash that could occur when using SimConnect_AttachExternalSecondarySimToSimObject. Clarifying DIS entity priorities documentation. Added TargetFrameRate in camera configuration documentation. Correcting mod operator description in RPN documentation. Added visual model GUID documentation in SimObject configuration. Corrected weapon xml file documentation. Consolidated SimConnect sample overview tables. Fixed table formatting in documentation for special effects. Created PDK sample overview replacing ISimObject sample overview. Updated missing units for feet per second and feet per minute in documentation. Fixed incorrect add-on installation path in documentation. I'd like to say I'm looking forward to the update, but I finally have all of my addons playing nice, oh well, what the hell, here we go again!